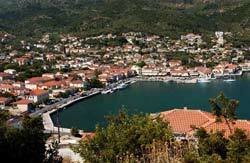 The Vathi is stretched inside a closed bay with sandy beaches and is the capital and the main port of the island. The houses are roofed with tiles with colorful windows and doors and along with the coastal road and the picturesque streets compose a beautiful picture. It is worthwhile to visit the house where Odysseus Androutsos was born, the Theater Library of the City, the Library of the Cultural Center, the bay Dexia, the island Lazareto, the coves Skinos, Thiliatrou and Sarakiniko and the Cave of the Nymphs, the ruins of the ancient city of Alalkomenes and the isthmus of Aetos. 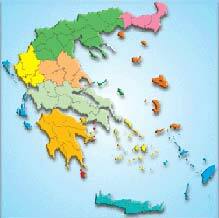 Nearby islands to Ithaca are the Arkoudi, the Atokos, the Vromonas, the Drakonera, the Karlonisi, Lasareto, the Makronisos, the Oxia, the Petalas, the Pontikos and the Provati. If you visit Ithaca, try meat or chicken in the pot, picarels with raisins, rosemary and rovani. It is worthwhile to buy potteries, embroideries and sweets.